KIDS will target two patches, KIDS-N and KIDS-S. The total area is 1500 sq.deg. KIDS-N runs along the equator in the NGC, from RA 10:00 to 15:52 (150 to 238 deg), and between declination -5 and +3 (with the exception of RA> 15, dec< -3). In addition it includes the area RA 8:40 to 9:08, dec -3 to -1. 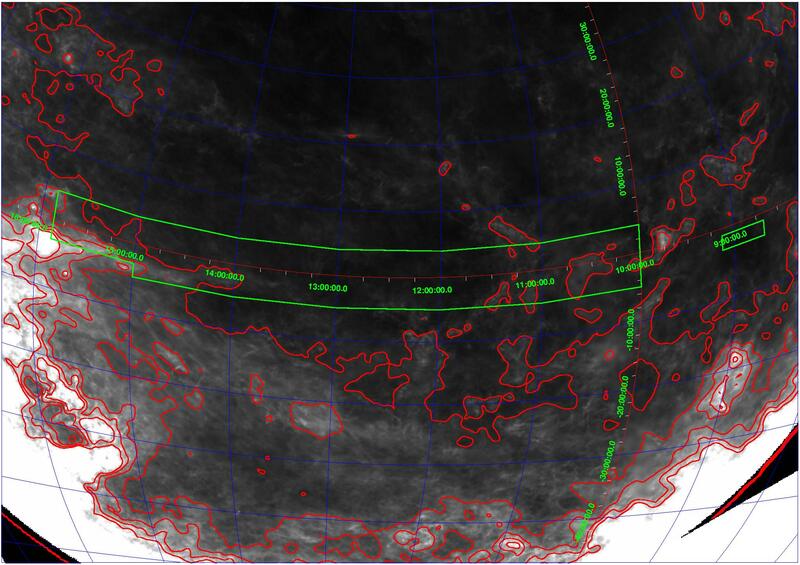 KIDS-S is a single rectangular patch around the SGP, between RA=22:00 and 3:30, and dec -35 to -25. The location of the fields, plotted on top of the Schlegel, Finkbeiner, & Davis 1998, ApJ, 500, 525 reddening maps, is shown below. The areas are outlined in green; B-V extinction is contoured at intervals of 0.05. The following proposal emerged from this (discussions KK, Wilman, Phleps, Schuecker). It is illustrated here for KIDS-N. (Click for a larger PS version). The KIDS-N patch is divided into square blocks, 9x9 degrees. A half-hour integration, plus 25% overheads, takes about 38 minutes, and in this time the sky rotates 9 degrees on the equator. 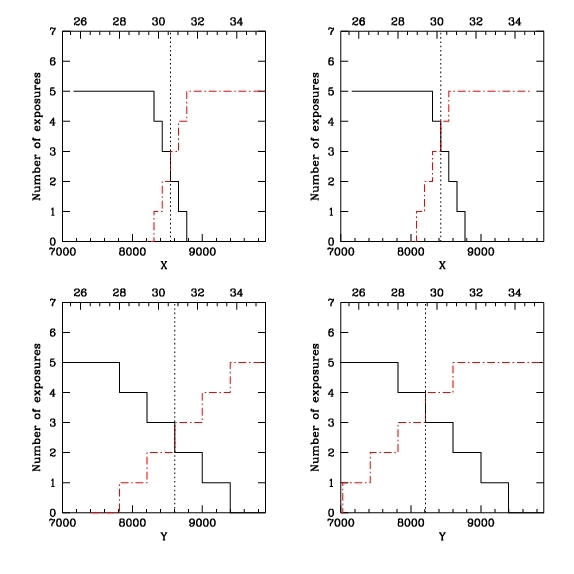 So on a good night one field can be observed from each block in r, or two fields in g (or u), etc. The blocks come in two varieties, 'inc' and 'dec' (increasing and decreasing RA coverage). They alternate along the KIDS patch. Within a block the sequence of observation is as shown in the lower panels of the figures. The first two declination strips are observed in opposite directions in the two blocks, so that where the blocks meet contiguous areas build up rather quickly. After about 1/4 of the patch is observed we will have a complete 2 degree-wide strip. From this point on, the remaining strips can be built up in order of increasing RA, and the distinction between Inc and Dec is no longer important. The first fours strips to be completed are those between declinations -2 and +2, where the spectroscopic AAO survey will take place. In the KIDS-S patch (declination -30) the sky rotates a factor 0.87 more slowly, so here the natural width of a block in RA is 8, not 9 degrees. where white indicates the area covered in all 5 exposures, and progressively darker shades indicate lower and lower total exposure time. 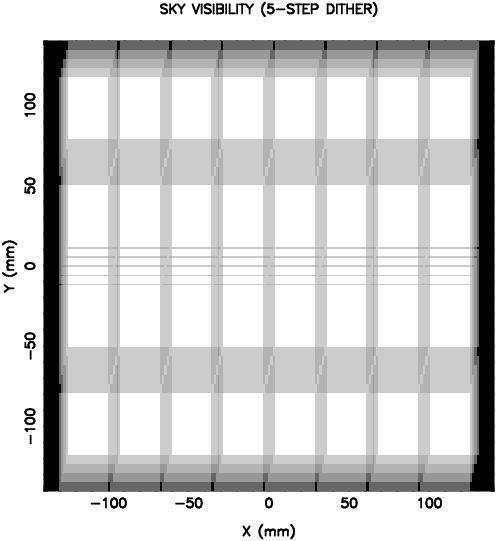 At the edges of the fields, the exposure level decreases from 5 to 0, in a staircase pattern with step width equal to the dither steps (25 arcsec in X, 85 arcsec in Y). These panels show the exposure levels at the edges of two adjacent dithered images. The top panels show the exposure versus X, the lower panels versus Y (which has bigger steps). 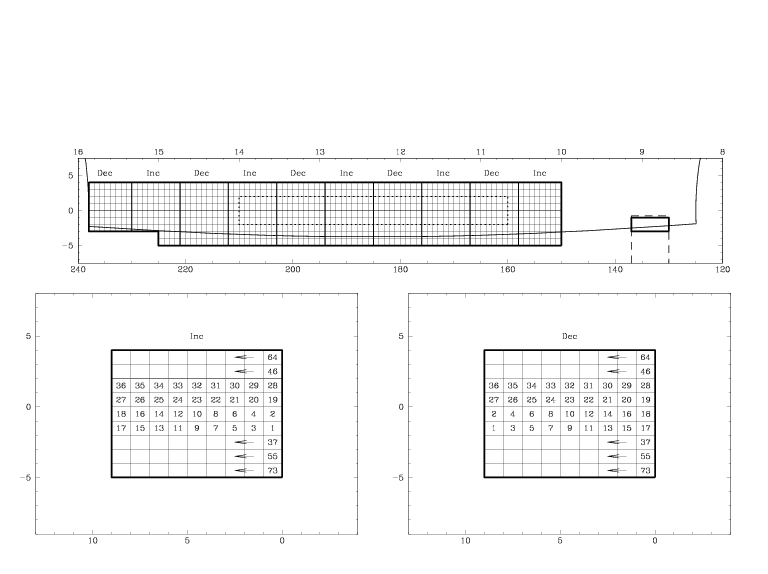 The horizontal axes are labelled in pixels (below) and arcminutes (above), and the center of the field is at (0,0). Option A is illustrated on the left. The field centers are separated by the full extent of the mosaic, so that the combined exposure level in the overlap area, obtained by summing the exposures from both dither sets, is everywhere nicely equal to 5. This minimizes the number of exposures but leaves no redundancy. It also means that in the data analysis results from different OBs need to be processed together, otherwise every pointing is surrounded by a rim where the total exposure is only 60% of that elsewhere. The field centers are separated by 3645arcsec = 60.76arcmin in X, and 3672arcsec=61.2arcmin in Y. (for a 0.2134arcsec/pix scale) Option B is shown on the right. The field centers are closer together than in option A (2 offset steps=50arcsec in X, 170 arcsec in Y closer). 80% exposure can now be achieved without having to add up observations from different fields, which simplifies the analysis. 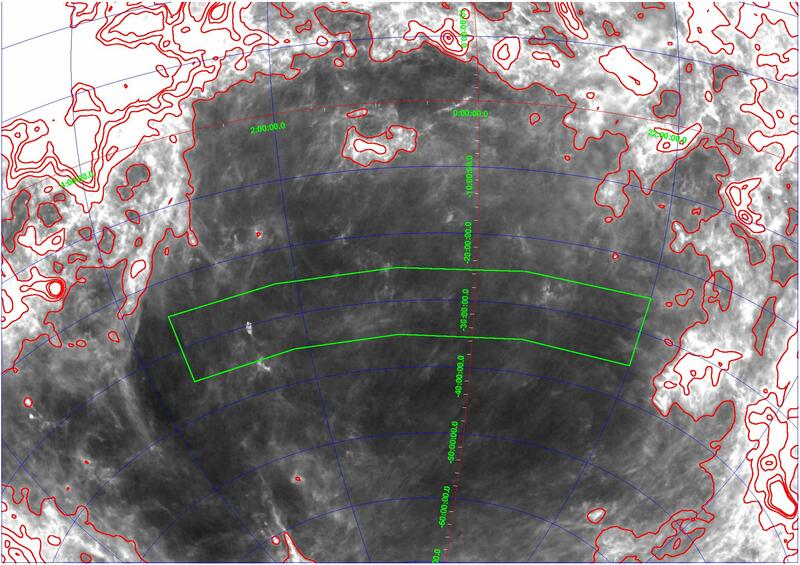 Moreover, there is now some redundancy: around each OB we have a strip that is 2 steps (50-170arcsec) wide, one degree long, that has received 4 exposures in one OB and 3 in another. The price for the overlap is (obviously) an increased number of field centers. Because of the redundancy and operational simplicity, option B is preferred. The resulting exposure pattern from a 2x2 set of fields is then as illustrated below. The darkest shade of grey represents 3/5 of the total exposure time. 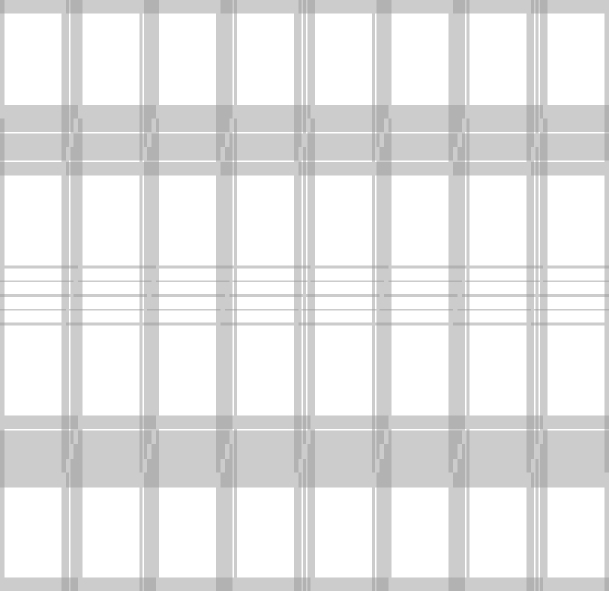 The grey horizontal and vertical strips marked with a + are the overlap regions where 4 exposures from one field overlap with three exposures from the adjacent one. A list of field centers that is compatible with these considerations, and that can tile the whole sky, can then be calculated. The result can be seen here.